Wonder how to delete text messages on iPhone X/8? Read this post to learn 3 methods to delete message on iPhone 8/X, even you want to delete them all at once and permanently. 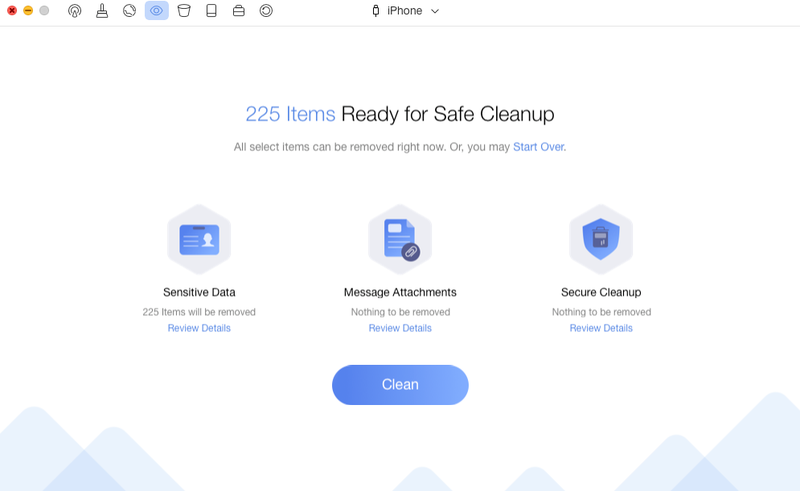 PhoneClean is the world’s first iPhone cleaning tool that helps clean up and remove unwanted files on iPhone for safe. Download it now and read this guide on 3 methods to delete text messages on iPhone 8/10. With the release of iOS 11, Message app on iPhone 8/X brings more fun. Besides edited pictures/videos, songs and apps sharing by iMessages, the popular 4 Bubble Effects and 9 Screen Effects are also still there. But the shiniest one must be the Animoji on iPhone X. But the more time you use this new Messages features on your iPhone 8/X, the more space these message conversations will take up. Or your iPhone 8/X has received too many advertisement and junk messages. Or some of your messages are too sensitive and personal, you don’t want to others to see it, and plan to remove them permanently. Don’t worry. In this tutorial, we will provide you with three methods to delete messages on iPhone X/8, for all of your situation. Check them now. Message app only enables you to remove multiple messages only by selecting one by one manually. If there are hundreds of messages, or more to delete, this way would be very time-consuming. Meanwhile they are not deleted permanently, either. They will still existed on iPhone 8/X for a while, till being overwritten. So if your request for easier multiple , or all, and permanent deletion, please move to Part 3 for the solution. Step 1. Go to Message app > Tap Edit. Step 2. Select the one(s) you want to delete. If deleting all, check them all one by one. Then tap Delete. If your plan is delete some specific message(s) in one conversation, please follow the steps below to make it. But please note that this way is as same as method 1. It will not erase the messages permanently, but Part 3 does. Step 1. Go to Message app > Enter the conversation. Step 2. Tap and hold on a message until the menu pops up > Then tap More. Step 3. Now you can choose the items you want to delete, and then tap trash icon. Or you can tap Delete All to remove them all. 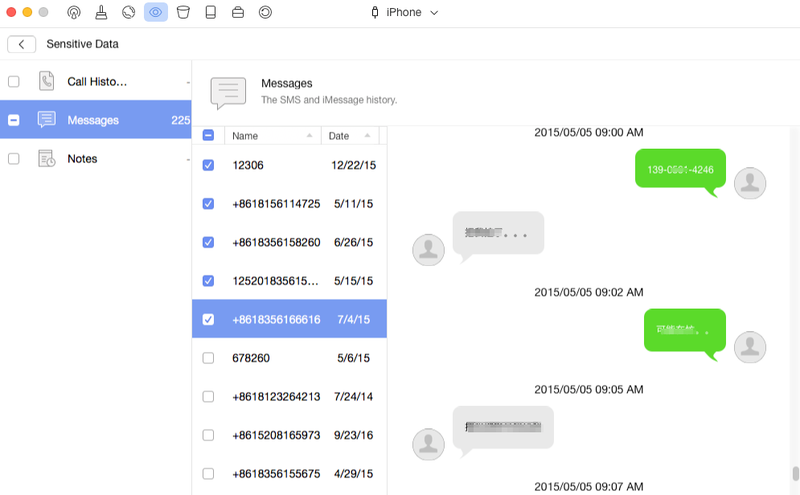 But in many occasions, users need to remove some messages permanently, such as the top-secret items, or when you plan to sell the device, and so on. So how to make it? We sincerely recommend world’s first iOS cleaning & optimization tool – PhoneClean to help you. Why? PhoneClean supports permanently deletingtext messages from iPhone 8/Xand make sure the deleted items cannot be recovered. Massively or selectively delete messages threads from iPhone 8/Xas you need. Besides messages, it also helps delete notes, call history, voicemails, and more. Also clear unneeded junk files like app junks, user caches, large and old files, Safari history, cookies and more from iPhone8/Xto free up space. So why not download it now, and follow the steps to permanently delete iPhone 8/X messages? Step 1. Run it on your PC/Mac > Connect you iPhone 8/X to it > Select Privacy Clean, and click Scan button to continue. Step 2. After the scan is over, double click Sensitive Data to view the messages on your iPhone. Choose the messages you want to delete, and then back to the result page. Step 3. Click the Clean button to remove messages from iPhone 8/X. As you can see, with PhoneClean, there are only three steps needed, and you can delete messages on iPhone 8/X permanently. Why not give it a try right now? If you have any question about it, you can contact us via email, or leave your messages in the comments below, and we will answer you as soon as possible.